September 24, 2015 – Engineers building NASA’s Orion are making manufacturing improvements for the spacecraft ahead of its missions to deep space destinations near the moon and on the journey to Mars. Program leaders opted to begin building Orion’s heat shield in blocks rather than as a monolithic structure, a move that signals the insights gained as a result of testing the design in space. The heat shield is one of the most critical elements of Orion and protects it and the future astronauts inside from searing temperatures experienced during reentry through Earth’s atmosphere when they return home. 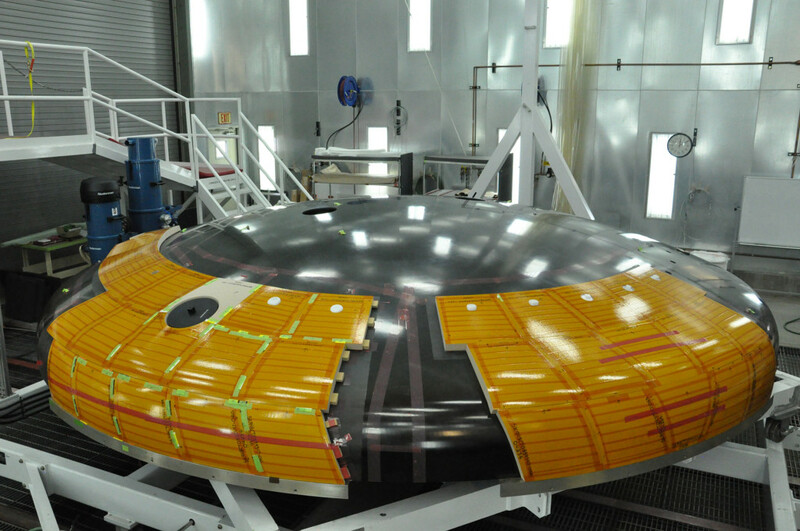 For Exploration Mission (EM)-1, the top layer of Orion’s heat shield that is primarily responsible for helping the crew module endure reentry heat will be composed of approximately 180 blocks that can be built in stages, easing the labor-intensive manufacturing process. Orion’s flight test, known as Exploration Flight Test-1 or EFT-1, provided an opportunity to develop confidence in the overall system and provide insight that can’t be gained from models in the laboratory. The heat shield experienced temperatures of about 4,000 degrees Fahrenheit and speeds approximately 80 percent of what it will endure when it comes back from missions near the moon, all while keeping the temperature inside the crew module in the mid-70s. 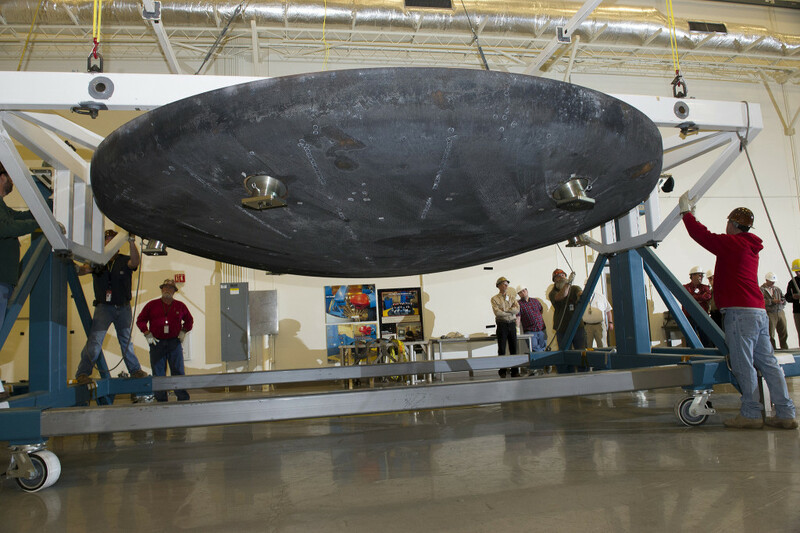 Post-flight examinations of the heat shield confirmed it performed well within expected tolerances. The heat shield was composed of a titanium skeleton and carbon fiber skin that gave the crew module its circular shape on the bottom and provided structural support, on top of which a fiberglass-phenolic honeycomb structure was placed. The honeycomb structure had 320,000 tiny cells that were individually filled by hand with an ablative material called Avcoat designed to wear away as Orion returned to Earth through the atmosphere. During the labor-intensive process, each individual cell was filled by hand as part of a serial process, cured in a large oven, X-rayed and then robotically machined to meet precise thickness requirements. However, during the manufacture of the heat shield for Orion’s flight test, engineers determined that the strength of the Avcoat/honeycomb structure was below expectations. While analysis showed, and the flight proved, that the heat shield would work for the test, the EM-1 Orion will experience colder temperatures in space and hotter temperatures upon reentry, requiring a stronger heat shield. Through lessons and data obtained from building and flying the heat shield, the team was able to make a design update for the Avcoat block design that will meet the EM-1 strength requirements. It is also expected to provide a cost savings and shorten the current heat shield manufacturing timeline by about two months. Engineers have now folded the update into the design review that will lock down the design for the next version. Across the country, elements of the Orion spacecraft for EM-1 are coming together. This month welding began on the next Orion destined for space at NASA’s Michoud Assembly Facility in New Orleans. In October, NASA will see the arrival of a test version of Orion’s ESA (European Space Agency)-provided service module for testing and analysis at the agency’s Plum Brook Station near Sandusky, Ohio, and is scheduled to complete its critical design review, a months-long review that demonstrates Orion is ready to proceed to full-scale fabrication, assembly, integration and testing.